If you’ve ever had to take a public speaking class — typically in college, or for professional advancement — you know just how absolutely nerve wracking it can be. It’s often stated that many people are less afraid of certain than they are of speaking in front of a crowd, and while that may be an exaggeration, it can absolutely feel that way when it’s your turn to speak to a room. You can panic, your heart booming away, your palms sweating like a faucet. It’s weird, but as social animals that evolved with an extremely real need to be accepted by the group, the fear of possible social rejection is as real as any physical threat. 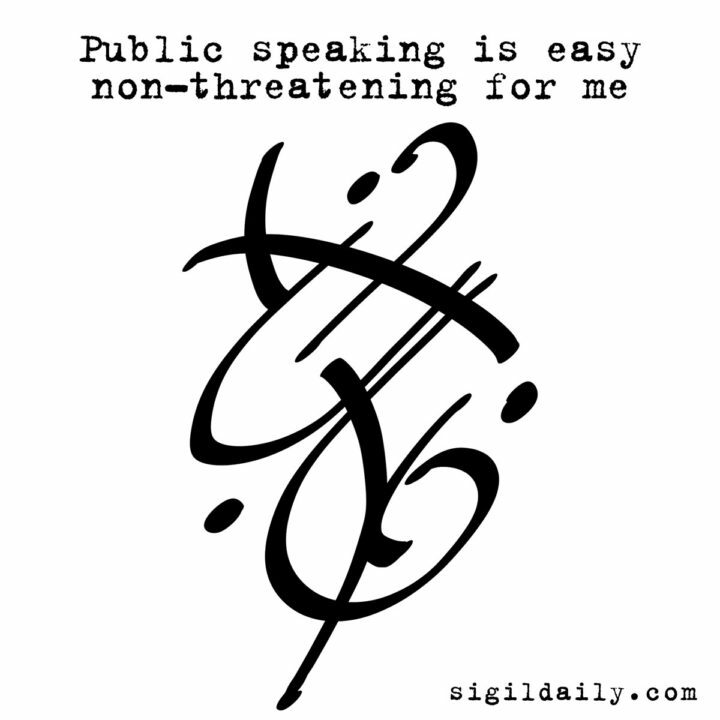 This sigil serves as a reminder that anyone can get over their fear of public speaking. Once you get the hang of it, and your inner primate brain realizes that you’re not going to die from giving a presentation or making a toast at your best friend’s wedding, it becomes much easier. In fact, people can kind of become addicted to it. Just visit any Rotary Club meeting, where people who were once absolutely terrified of public speaking now find excuses to do it — for fun! Think of it like the safer version of skydiving. Once you get over the fear, all you think about is finding another opportunity to get that rush of adrenaline again.